The United Kingdom produced its own variant of the Belgian FN FAL incorporating the modifications developed by the Allied Rifle Committee, designating it the L1A1 Self Loading Rifle (SLR). The weapons were manufactured by the Royal Small Arms Factory Enfield, Birmingham Small Arms, Royal Ordnance Factory and ROF Fazakerley. After the production run ceased, replacement components were made by Parker Hale Limited. The SLR served the British Armed Forces from 1954 until approximately 1994, being replaced by the L85A1 from 1985 onwards. The L1A1 and variants have seen use in several conflicts, including as part of the Cold War. 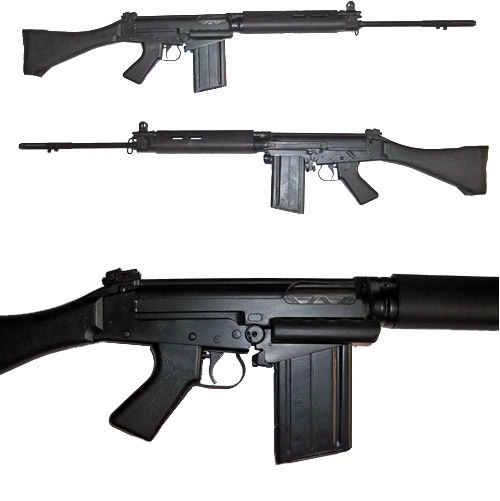 L1A1s have been used by the British Army in Malaysia, Northern Ireland, and in the Falklands War (in opposition to FN FAL-armed Argentine forces), the First Gulf War (where it was preferred by some soldiers to the untried SA80), by Australia and New Zealand in Vietnam, and by Rhodesia in the Rhodesian Bush War. These are genuine UK made L1A1’s with either UB or UE serial numbers. They are deactivated to new specification with removable Fal magazine, moving trigger and cocking handle. They come with medium size but plate and good condition furniture, but with no swivels. Sold with London Proof House certificate.